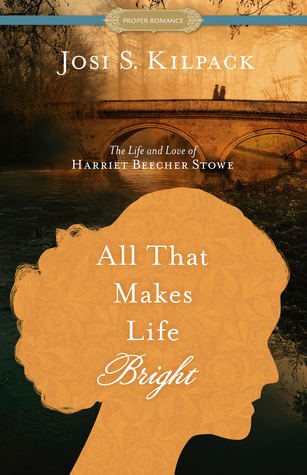 I’ll admit, I had no idea who Harriet Beecher Stowe was before I picked up this book. Thank you, Google, for enlightening me. Once I started reading, I realized that this was not the usual fictional account of her entire life, but more of her life as a mother and wife. Harriet wanted to be a writer, but when she finds herself a mom of three children under the age of 2, it’s more than she can handle. At first I was a little mad at her for not “stepping up” and being a mom first, but the more I read, the more I realized that she was doing the best she could. And when she could do no more, her body gave up for a while and she was forced to step back and relinquish her duties and recoup. Times were different back then. You were “supposed” to do it all and not complain, but I bet there were many struggling just like her, but were too afraid to do anything about it. Her marriage was again, just like many marriages at the time. The man expected to walk in and the house be clean and food on the table, but without having to do any of the household duties. As I was reading, I wanted to ring Calvin’s neck for not helping, but then I had to remember the times were different. But, I will say that after a while he stepped up and did what needed to be done, in order to have a healthy wife and a happy family. This was not my usual romance, in the sense that they were already married. I felt this story was more than about love, it was about life, real life. This touched me very deeply. I, as with many moms out there, struggle with finding a balance being a wife and mother while not losing our own identities. Harriet struggled with that greatly. Watching her was like looking in a mirror. Or better yet, being a fly on my wall, when my children were toddlers.